A few months ago, a curator at the Honolulu Museum of Art stumbled upon a rare 19th-century manual on Japanese art that he didn’t even know existed in the museum archives. Stephen Salel had been searching for materials for an exhibition devoted to female Japanese manga artists. Recognized today as a subgenre of graphic novels, manga as an artform dates to the nineteenth century, and Salel was looking specifically for work created by Katsushika Oi (1800-1866), considered by many experts to be the first female manga artist. If the name sounds familiar, that’s probably because she was the daughter of Katsushika Hokusai (1760-1849), whose 1823 woodblock print, The Great Wave Off Kanagawa, has been reproduced countless times around the world. Finding illustrations by the younger Katsushika proved challenging for Salel, yet he was relentless in his pursuit. Her work is at the Tokyo National Museum and at the Ukiyo-e Ota Memorial Museum of Art, but he wanted to confirm whether the Honolulu Museum had any material lurking in its archives. “I felt very confident that I could find one of her books in our own collection,” said Salel recently. Salel scoured the Honolulu Museum of Art’s holdings until he came across the Illustrated Handbook for Daily Life for Women, published in 1847--the missing link for his show. The publication date and accompanying illustrations led Salel to conclude that this was an example by his elusive artist. “It was one of those times I felt like I might have made the right career choice,” he said. 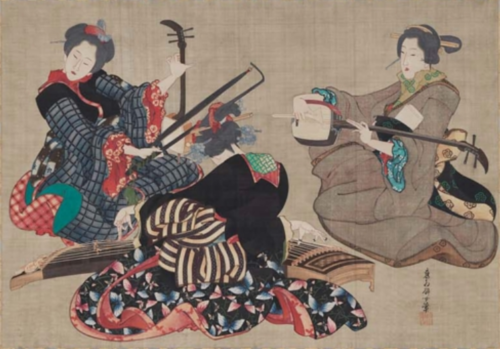 The book was acquired by the museum in 2003 as part of the 20,000 piece Richard Lane Collection, which includes Japanese, Chinese, and Korean prints, books, and paintings from the Edo Period (1615-1868). Salel’s manga exhibition is slated for 2021--plenty of time to continue sleuthing for more forgotten treasures. A few months ago, a curator at the Honolulu Museum of Art stumbled upon a rare 19th-century manual on Japanese art that he didn't even know existed in the museum archives. Stephen Salel had been searching for materials for an exhibition devoted to female Japanese manga artists. Recognized today as a subgenre of graphic novels, manga as an artform dates to the nineteenth century, and Salel was looking specifically for work created by Katsushika Oi (1800-1866), considered by many experts to be the first female manga artist. If the name sounds familiar, that's probably because she was the daughter of Katsushika Hokusai (1760-1849), whose 1823 woodblock print, The Great Wave Off Kanagawa, has been reproduced countless times around the world. Finding illustrations by the younger Katsushika proved challenging for Salel, yet he was relentless in his pursuit. Her work is at the Tokyo National Museum and at the Ukiyo-e Ota Memorial Museum of Art, but he wanted to confirm whether the Honolulu Museum had any material lurking in its archives. "I felt very confident that I could find one of her books in our own collection," said Salel recently. Salel scoured the Honolulu Museum of Art's holdings until he came across the Illustrated Handbook for Daily Life for Women, published in 1847--the missing link for his show. The publication date and accompanying illustrations led Salel to conclude that this was an example by his elusive artist. "It was one of those times I felt like I might have made the right career choice," he said. Salel's manga exhibition is slated for 2021--plenty of time to continue sleuthing for more forgotten treasures.